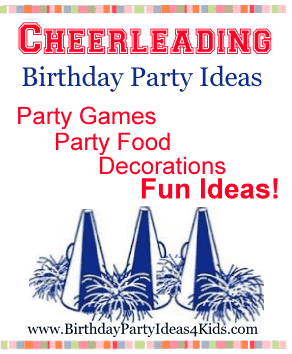 Great ideas for a Cheerleading Birthday Party for Kids. Cheerleading is a very popular sport and it also makes a great birthday party theme. These party ideas will have everyone at the party cheering! 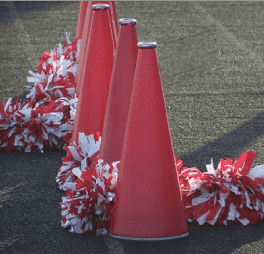 Make cute Rooter Pom Poms for a fun activity and decorations for the Cheer party! See our easy Rooter Pom Pom video for complete instructions. Have a cheer made up for each girl with her name in it. While you are playing games have the girls cheer each other on with their special cheer. See our party games for girls or our sleepover pages for more party game ideas. Make foam megaphones with the girls names and decorate. Make felt pennants and let the guests decorate with sparkles. Decorate wooden door hangers - paint and attach little cheerleaders and pompom’s. Make pompom’s from plastic tablecloths and let the girls use them in their cheer. Make spirit sticks from large wooden dowels. Add glitter, feathers, ribbon, etc. to decorate them. Place a number on each one. Write the same numbers on pieces of paper, fold and put into a hat. Let the guests choose a paper from the hat. The number they get is the spirit stick they will take home. Make sugar cookies and cut out with a gingerbread man cookie cutter - let the guests decorate them like cheerleaders with icing, sprinkles and writing gel. Small megaphones and any of the crafts / activities done during the party. Decorate cute megaphones with the guests names and fill with candies and little surprises. Wrap in clear cellophane and tie with ribbons in the party colors. Decorate plain bags with cheerleader theme stickers. It’s _________ (birthday girl’s name) Birthday! Then write in party information. Choose two colors to be your “teams” colors for the evening and decorate with those colors. Hang plastic pompoms from the trees outside the party venue and make signs that stick in the ground that say "Go Team", etc. and line the up the walkway to the party. Create pompom’s from plastic tablecloths in your team colors and hang around the party room. Make large megaphones from poster board and hang around the party area. Small plastic megaphones can be used to hold snacks at the party table. Set out a cooler with ice to chill your favorite drinks. Create a cheer for everyone to learn at the party. Make up one for the group and then one for each of the girls with her name in it. Practice until it’s perfect and then video tape the performance. Make copies for everyone to take home.